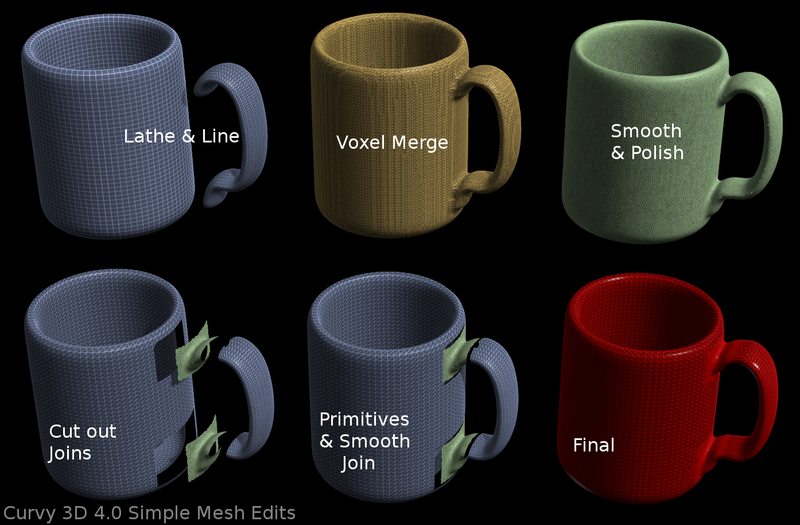 If you've tried Curvy's Voxel Merge you will notice it makes a fine dense grid mesh that does not fit the level of detail or curvature of the original meshes. However it does offer a very useful way to merge objects. To get the best of both worlds you can use Curvy's "Stitch Holes" to automatically fill in the gaps between multiple meshes that you have "Joined" into one mesh. For example, here is a mug. The primitive shapes are very smooth and have an ordered mesh structure. The Voxel Merge of these shapes follows the shapes well but is over dense and not a nice flow of faces. I can improve the flow of faces a bit using the smooth, polish and relax commands. I used the Mask Rect tool to clip out the bits of the original primitives, and the joined seam. Then "Join" them together and let "Stitch Holes" do the rest. Image fullsize so you can see the mesh pattern. NEW FEATURES - In 4.0 you can direct the Stitch Holes and Cap Holes commands to work on Masked vertices, making them much easier to use on large complex meshes.